What’s Popular in Stamped Concrete for 2018? 2018 is well under way and if you have not noticed, the snow is already beginning to melt. Meaning, your driveway and patio is slowly making an appearance, which is why it is important to start maintaining your curb appeal now. A new year means a new look and Bomanite experts are highly experienced in stamped concrete and know exactly which styles to choose to give your driveway that rich glow. Show off yard this year by staying up to date with current trends that Bomanite proudly supplies. Below we have listed the most popular options for concrete this year. Exposed aggregate – Exposed aggregate is a unique concrete product that blends modern patterns with vintage prestige because the finishing coat displays all the stones and pebbles that lay underneath the concrete. The exposure of rocks creates a realistic representation of natural textures, while supplementing a smoother, and extremely durable surface. Exposed aggregate comes in a variety of colours that you can customize to fit your home’s aesthetic. Limestone concrete pool decks – Limestone concrete is a strong and more resistant product that when installed contrast a stunning finish, and are especially beneficial around a pool. Due to limestone’s durability, the product is able to withstand large bodies of water and last longer than other concretes. Cool tones of grey – Settle for more relaxed tones of grey on your walkways or patios for a simple but eye-catching appearance, and also flattering throughout the whole year. It is never too early to plan for summer renovations and consulting professionals like Bomanite ensure the efficiency and attraction of your walkway. Luckily, you can visit Bomanite experts at the National Home show on March 9th to 18th 2018 where they will be available to answer any questions or concerns you may have. Posted on March 6, 2018 March 6, 2018 Author adminCategories Concrete Driveways, Concrete Flooring, Concrete Pathways, Concrete Patios, Concrete Pools, Exposed Aggregates, Stamped ConcreteLeave a comment on What’s Popular in Stamped Concrete for 2018? If you haven’t begun outdoor holiday decorating, a good place to start is with your front door, porch or walkway. Nothing is more welcoming for your guests than a splash of greenery, simple bows or a lush wreath that says, “Happy Holidays”. You can be as simple or as elaborate as you wish, but before the temperatures drop any further get in the creative zone, put on some festive music and go at it. Here’s how. Hang a beautiful wreath on your front door. Many nurseries have them as simple or as lush as you would like. You can pick one up at your local grocery store if time is of the essence. For added sparkle, you can purchase some battery-operated lights for an added festive feature. Look for them at Chapters Indigo, Pier 1 or anywhere Christmas lights are sold. You can also opt for an artificial one. Decorate it yourself with ornaments or pinecones. Ideas are endless for either one. You know those urns of potted plants you had all summer? Yes those. You can either pot a real cedar tree on either side of your door, add white lights or you can refill them with greenery, some dogwood, pine stumps, holly and a bright bow to make your porch festive and welcoming. There are two types of cedar, BC cedar that is softer and drapes beautifully, or Ontario cedar, which is great filler and adds volume. A mixture of greenery makes your urn fuller and richer. You can add some seeded eucalyptus or salal leaves. Add a garland of greenery – Most places will offer cedar and pine garland and you can hang it around your porch or banister. Line it with white lights or coloured lights. Now you can be festive both day and night. Add spotlights – If strings of light are too much for you, settle on coloured spotlights to highlight your home. Try a combination of colour like red and green or opt for a monochromatic palette like all blue, all green etc. There are some new products out there so visit your local Canadian Tire, Home Depot or Lowes for more ideas. Check out your local retailers on how to light up that beautiful Bomanite walkway. Keep in mind that they have to work with or without snow or possible rain. Your best bet would be path lights that are put up and connected to the rest of your outdoor lights. It’s a good idea to work them into your Christmas light display like the below example. For more inspiration, search Pinterest or Google. You’ll find plenty of ideas online or even at your local retailer. Bomanite’s concrete design centre is where all the inspiration lies! From residential concrete services such as concrete driveways and walkways all the way to concrete pool decks, patios and more, this is where you will find everything you need to create your vision. Bomanite’s concrete design centre is newly renovated and offers the perfect place to browse through concrete products and choose exactly what you are looking for. There is plenty of space and a wide selection, so customers are able to take their time and explore everything Bomanite has to offer. It’s harder to imagine what something would look like without actually seeing and touching it. That’s why we encourage clients to come in and see for themselves exactly what our concrete is all about. You will also have a chance to talk to our experienced consultants who will be prepared to help you with any ideas and concerns you may have. Whether you are trying to create a concrete driveway, walkway or any other type of design, they will be able to assist you. Bomanite’s concrete design centre is located in the heart of Vaughan, near Highway 27 and Highway 407. Whether you live in Brampton, Mississauga, Markham, Vaughan, Toronto, Oakville, Milton or any other part of the GTA, we are accessible to you! Contact us today to schedule your visit or take a look at bomanite.ca for more information! Everyone wants a beautiful home and Bomanite is here to help you achieve exactly that. Installing stamped concrete for your driveway or patio creates curb appeal and automatically increases the value of your home. Cost efficient – Stamped concrete will make your surface resemble products like brick and stone without paying the equivalent of what those products would cost. Stamped concrete is more affordable because the entire installation process involves less work, and minimal materials are used to lay out the product. You get a beautiful look for a great value. Less maintenance – Stamped concrete has a smooth finish leaving no room for weeds to grow in between cracks, making it easy to clean away any dirt or residue. Slip resistant – During the rainy and snowy months, your outside walkways can become a safety hazard; however, Bomanite’s stamped concrete provides slip resistant materials to ensure every step is safe. Curb Appeal – There’s no denying it – every home automatically looks more stunning after the addition of stamped concrete to either the driveway, backyard or both. By amplifying the appearance of your home, you will also instantly increase the value. First, the expert pours the concrete on the designated surface (it can be placed on top of previous concrete applications). After the product is evenly distributed, the design of your choice is stamped on top for a natural, clean look. Conveniently, stamped concrete comes in a variety of colours and can easily be matched to the exterior of your home. Bomanite offers stamped concrete that will positively transform your yard, having people stop to admire a job well done. Experts at Bomanite are highly experienced in installing stamped concrete with a guarantee of top quality and professional services. By applying a safer, longer lasting concrete, you save money while increasing the value of your home. 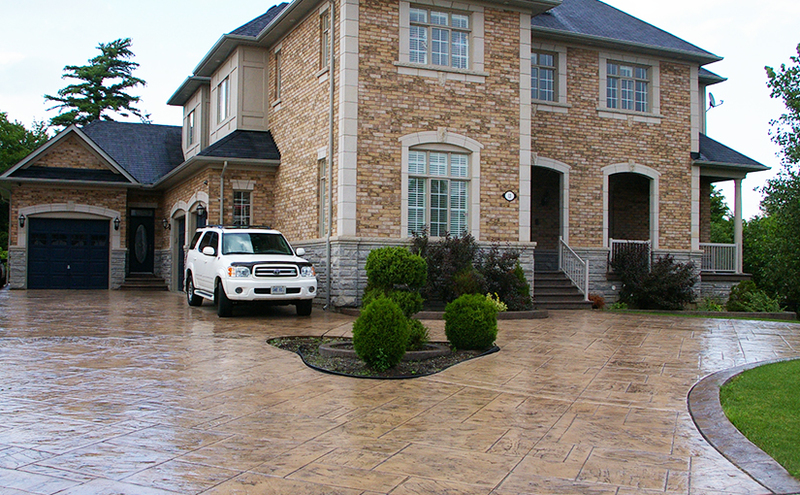 Bomanite offers stamped concrete services in Vaughan, King, Kleinberg, Maple and across the GTA! For more information about stamped concrete driveways, walkways, patios and more, visit our website. With summer just around the corner, the thought of jumping into a refreshing pool is exciting and intriguing, but before you can begin building, you must ensure the job will get done properly. Bomanite wants you to successfully install a pool that will provide you with the backyard of your dreams. Hiring an expert to install your pool will not only make your pool visually appealing, but they are willing to cater to your needs to map out, shape, size and depth of your pool correctly. Professionals are conscious of the important elements in your backyard surroundings like sprinklers, trees and gardens as well as consider different ways to approach the project without damaging or putting your home at risk. Installing a pool and concrete pool decks can be expensive. After carefully observing your backyard, an expert can work out pricing and stay within your decided budget. A pool is a long-term commitment and it is important to invest suitably. It is also important to consult a landscape expert, like Bomanite, before planning to install your pool. We will ensure that you have the perfect strategy to move forward with your backyard renovation. With the help of skilled consultants at Bomanite, you are guaranteed to have the most beautiful concrete pool deck imaginable. Bomanite offers an array of products including concrete polishing, allowing your pool to be the first thing you see and adore once you step outside into your yard. We would be more than glad to service you with a concrete pool deck! Bomanite is available in Mississauga, Richmond Hill, Milton, and Aurora. Visit bomanite.ca for more information. With the new year upon us, it’s time to start thinking about all the diverse options for your driveway! Even though you can’t see it under all the snow, this is the time to consider spring, summer and fall, and how your driveway will look in the months to come. We understand that it may seem early, but to ensure that your driveway will look the best it can during 2017, you should start booking now! There are so many options to create the driveway of your dreams. Stamped concrete is always a beautiful choice, and one of our expert areas at Bomanite. When it comes to a stamped concrete driveway, there is so much versatility. Stamped concrete is available in an assortment of colours, textures and patterns, so your vision can become a reality. Exposed aggregate is another modern option for your driveway in 2017. Creating an intricate visual effect of exposed stones and pebbles within concrete, your home will have stunning curb appeal after this treatment. If you’re aiming for a natural look, a limestone driveway might be your first choice. A Bomanite limestone concrete finish will create a strong and durable driveway which will maintain its beauty for a long time. Bomanite would love to service you with your own concrete driveway in 2017. Contact us today or visit our website for more information. Bomanite Featured on Moving the McGillivrays! In HGTV’s new series, Moving the McGillivrays, popular renovator and host of Income Property, Scott McGillivray and his wife Sabrina plan and develop their lifelong family home. Every episode in the series features a glimpse into the creation of their dream home, as well as a look at their busy life, taking care of their two daughters and balancing full-time jobs. In Episode Four of this exciting new T.V. show, Scott has the chance to build something he’s been wanting his whole life: a workshop. But it’s not just any ordinary workshop. Scott is building his perfect workshop: a man cave. Meanwhile, Sabrina is creating a space for schoolwork and crafts, which she calls her femme-den. It takes a lot of work and planning to build the room of your dreams. One of the most important parts of the whole process is the foundation, which Bomanite had the honour of taking care of. Featured on this episode of Moving the McGillivrays, Bomanite lays concrete with a cool finish in the workshop, creating a canvas for the rest of Scott’s man cave. Bomanite was extremely honoured to be a part of HGTV’s Moving the McGillivrays. This was the opportunity of a lifetime for everyone involved! Bomanite would love to be a part of creating your dream home. Whether it is stamped concrete, exposed aggregate or any other residential or commercial service, call us today for a free quote or visit bomanite.ca for more information. Posted on November 9, 2016 Author adminCategories Concrete Designs, Concrete Driveways, Concrete Flooring, Stamped ConcreteLeave a comment on Bomanite Featured on Moving the McGillivrays! Exposed Aggregate Concrete is the Modern Option! Stamped concrete is undeniably beautiful and creates a wonderful look for your home. However, there are other options to select from and Bomanite wants you to be informed before you make your decisions! A new trend that is actually a lot more modern than you may think is exposed aggregate concrete. This decorative style of concrete can be used in multiple areas of the home including driveways, walkways and patios. It is a popular choice for each of these areas due to its aesthetic value, low maintenance, and non-slip surface. It is also extremely durable and strong, which is why it can be used in almost every outdoor design. Exposed aggregate concrete is extremely popular due to its smooth finish, which displays small stones and pebbles within the concrete. It is available in a variety of colours, so you are able to customize the appearance to your preference. There are so many advantages to exposed aggregate for your home! Not only can you use it almost anywhere, it is also a unique look that most people don’t have. It is both beautiful and durable, which is all you could want for your home! We would be happy to service you with exposed aggregate concrete if you live in Toronto or the surrounding area. Call us today for a free quote or visit bomanite.ca for more information. Posted on August 30, 2016 Author adminCategories Concrete Driveways, Concrete Pathways, Concrete Patios, Exposed Aggregates, Stamped Concrete, Toronto1 Comment on Exposed Aggregate Concrete is the Modern Option! Concrete comes in many different types of finishes! It’s not always easy to pick when there are so many options available to you! What you may not know is that Bomanite specializes in a sandscape concrete finish for outdoor applications. A sandscape finish offers a twist on a traditional look through the possibility of many different patterns and styles. The final product is always a modern look that elevates the look of a building. Not only does sandscape concrete look great for pool decks, driveways and walkways, but it also the perfect option for commercial concrete services. Through specialized mix designs, additives and advancements in application, Bomanite has created a specialized Sandscape Texture. This offers the perfect, modern option for outdoor concrete finishes. If you’re looking for a stunning but also practical concrete finish, then you may want to consider sandscape. This finish is an economical alternate to other types of decorative concrete. It is durable, attractive and easy to maintain. It’s a great option for those looking at an upcoming outdoor renovation. Everyone is constantly looking for the latest outdoor trends to elevate the overall look of their home. One thing that is guaranteed to never go out of style is a concrete pool deck. If your backyard has a pool, you know that it is the focal point of the yard. That’s why the surrounding area should highlight and emphasize your pool, which is exactly what a concrete deck can do. There are so many options to select from if you opt for concrete in your backyard. Different colours and textures are available, so each pool deck can be customized to suit your own stylistic preferences. With all these options, you will be able to select a design that will complement the exterior of your home and also supplement your outdoor environment. Stamped concrete pool decks are one of the most popular options. It offers durability and strength as well as the ability to replicate traditionally expensive materials such as stone or wood. Architectural concrete is also a possibility if you would like an intricate design around the pool. Less common, but extremely attractive, is an exposed aggregate concrete pool deck. This style creates an exposed finish, which means small stones and pebbles become visible. This modern look can create an interesting pool deck unlike what you may be used to seeing. Bomanite would be happy to service you with a concrete pool deck! Call us today or visit bomanite.ca for more information.